The Megabass Bumpee Hog, strong to a fault? Introduction: Megabass may be best known for their line of premium fishing rods and innovative hardbaits but the company also offers a wide range of unique plastics. This includes the company�s line of VIOS baits which make use of a soft but ultra durable plastic. We take a look at a lure in this series that Megabass has dubbed the Bumpee Hog. Impressions: Megabass has delivered many times when it comes to enthusiast grade product. The company�s rods remain some of the most detailed and creatively crafted sticks that strike an exclusive combination of art and functionality. The company�s baits were once extremely hard to acquire, but increased distribution has helped make them more available, though the prices continue to be a barrier for some anglers. It is no surprise to me that Megabass is pushing forward with a complete range of plastics, but the question is whether or not the company is able to innovate in the same way that they did with hardbaits. When I first saw the Megabass Bumpee Hog I just couldn't wait to fish this plastic. 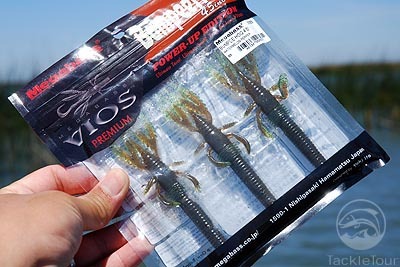 The Megabass VIOS baits make use of a plastic that is approved by F.D.A. and exhibits characteristics such as exceptional shape retention capability, and bio and photo degradability. 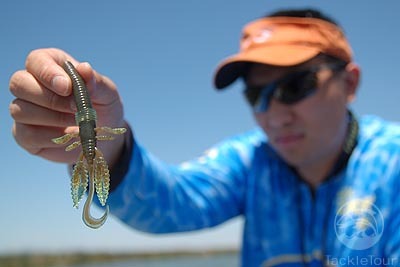 The Bumpee Hog�s design allows more than one color material of different weight to be combined together, giving the lures a unique color and transparency. 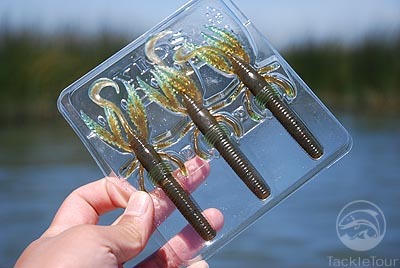 Megabass is able to change the tip of the claws on the Bumpee Hog, much like a laminated or core shot plastic. Megabass states that the �VIOS baits can be used again and again without breaking easily and the natural formula stays with the bait much longer.� Remind you of anything? The minute I heard this both the Cyber-Flexx Terminator SnapBack Super Plastics, and Strike King 3X Soft Plastics both came to mind. 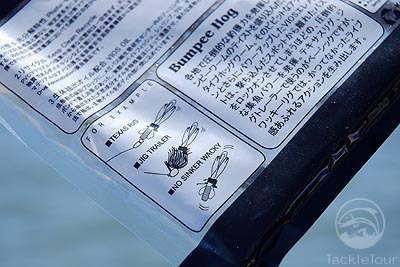 When I first examined the Bumpee Hog I noticed the protective re-sealable pack that the lures come in. The minute you open the pack you can smell the scent the lure is infused with, the scent isn�t overpowering and reminds me of fish oil. The lure itself is covered in the scent and the lure actually feels slick and oily to the touch. When I started rigging the Bumpee Hog the lure further reminded me of the old Terminator and Strike King baits which make use of 3X Soft Plastics Cyber-Flexx materials. These baits made a big impact when they were first released to market, only to fade away into tackle oblivion. 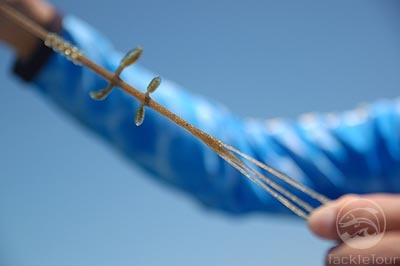 The durability of the plastics wasn�t enough to make up for the high cost, and while some anglers swore by the floating presentation many anglers simply didn�t like the way the plastics presented themselves underwater, requiring anglers to change up their techniques to compensate for the increased floatation. 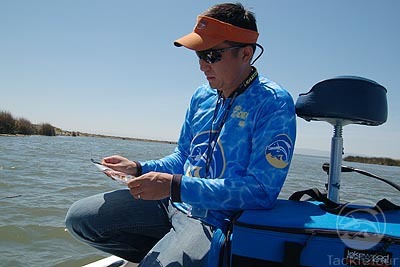 Real World Test: When I was done tugging the baits to see just how far they would stretch it was time test the Megabass Bumpee Hog, and for this I head to the stained water of the California Delta to assess the bait side by side with other creature baits and crawdad imitators. We fished the Bumpee Hog on both Toray and Sunline Fluorocarbon line and rigged the bait a few different ways. 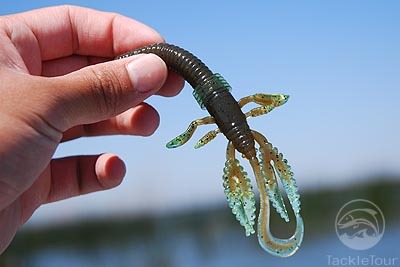 Casting: The Bumpee Hog is heavy enough to be cast weightless for extremely subtle presentations but being a crawdad bait I preferred to put the lure right on the bottom. 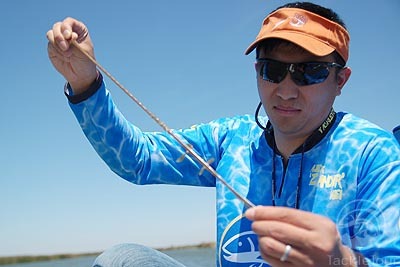 This meant adding a bullet sinker and rigging the lure Texas style or sticking it on the end of a jig for punching through vegetation. Either way casting the Bumpee Hog was undemanding and equally uneventful.